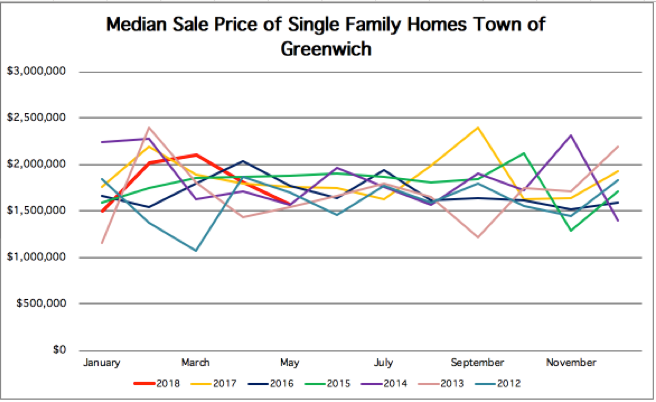 June 21, 2018 (Greenwich, CT) – The Greenwich Association of REALTORS® announces the statistics for home sales in The Town of Greenwich, CT for the month of May 2018. There were 54 single-family residential closings reported during this period according to figures provided by The Greenwich Multiple Listing Service, Inc., the multiple listing service used by REALTORS® in the Greenwich area. The number of single-family residential closings increased, compared to May 2017 when there were 53 closings in May. The median sale price for a single-family home decreased to $1,575,000 from $1,767,500 the median sales price in May 2017. The average days on the market (DOM) for residential homes was 254 days; which was a increase from 235 days in May 2017. There were 13 condo/co-op residential closings reported during this time period, which was a decrease, compared to May 2017 when there were 16 closings. The median sale price for a condo/co-op increased to $1,000,000 from $607,000 the median sales price in May 2017. The average days on the market (DOM) for condo/co-op residential homes was 107; which was a decrease from 160 days in May 2017. “May 2018 had fifty-four sales, from fifty-three sales last year. The median sale price decreased from $1,767,500 in May 2017 to $1,575,000 this month. The number of new listings that came on in May 2018 increased to 172 from 160 last year. Greenwich is still standing as the strongest sector from the beginning of the year. Greenwich closed twenty-eight sales, with a 26% median price increase to $2,440,000 from $1,933,750 from May 2017. 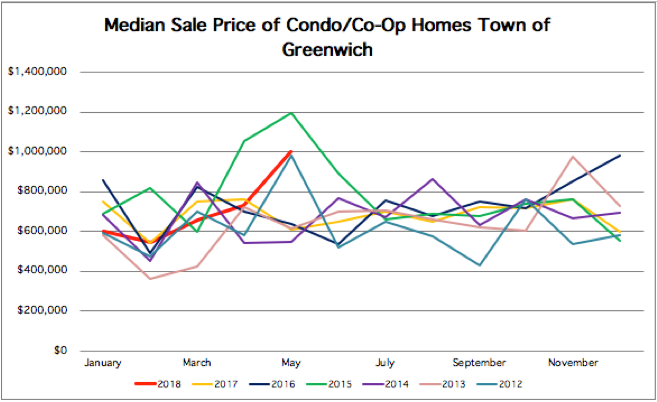 Condo/Co-Op sales decreased when compared to May 2018 to thirteen from sixteen last year, however, year to date sales are in line with the sales from 2017 and 2016. The median price had a 64% increase to $1,000,000 from $607,000 last year. Current pending sales for Single Family homes are 84 and 17 for Condo/Co-Op. As the spring market is coming to a close and the summer is quickly approaching us, the sales have continued to increase, which leaves us hopeful we will end this years spring market on a positive note”, stated BK Bates, 2018 President of the Greenwich Association of REALTORS®.